EDITOR’S NOTE: This is our running post on Aldi’s food Christmas products. We will update it with new products throughout the holiday season, so be sure to check back in. Read about Aldi’s non-food Christmas products at this link. To check out Aldi’s Christmas storage offerings, click here. Thoughts: Comes in an 18-oz. tube. Choose Christmas Tree or Candy Cane images. Thoughts: Choose Ninjabread or Ugly Sweater cookie kits. Kits are between 9.5 and 11.5 oz. Thoughts: This includes 10 cookies in a 13.5-oz. package. Thoughts: These are 15.87 oz. and come in assorted varieties. Thoughts: These are 6.17 oz. and come in assorted designs. Thoughts: This comes in a 48-oz. carton and is available in Egg Nog or Peppermint Bark Moose Tracks flavors. Thoughts: This 4.23-oz. package includes 12 packs of coffee, which comes out to 59 cents per cup. Flavors include Candy Cane, Chocolate Coconut Blizzard, Glazed Cinnamon Roll, Hot Buttered Rum, Spiced Egg Nog, and more. Thoughts: This comes in a 32-oz. carton. Thoughts: This comes in a 29.3-oz. box and contains all you need for a fun and edible project. 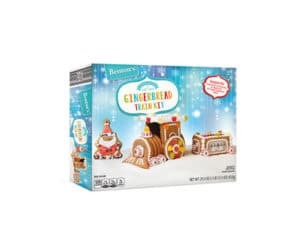 Read our review of Aldi’s similar gingerbread house kit at this link. Thoughts: This 9.95-oz. package contains what you need to make Christmas tree, Santa, and gingerbread man cookie ornaments. Thoughts: This 23.5-oz. package contains 24 sugar cookies. Thoughts: This 12-oz. package contains a dozen muffins. Thoughts: This comes in an 11.3-oz. box. Thoughts: These 12-oz. packages of coffee come in Gingerbread, Mocha Mint, and White Chocolate flavors. Thoughts: One year after being a hit over in the United Kingdom, Aldi’s Wine Advent Calendar is headed to the United States. (November 7, 2018, to be exact.) The calendar comes with a variety pack of 24 different Aldi wine-mini bottles, including red, white, rosé, and bubbles. By our math, that come out to about $3 a bottle. If the early hype is any indication, we don’t expect this to last long in stores. Thoughts: Alongside the Aldi Wine Advent Calendar, Aldi is debuting a cheese calendar. This a brand-new item not previously sold elsewhere, and features 24 imported mini-cheeses. In 2018, it lands the same day as the Wine Calendar: November 7, 2018. We expect it to last about as long as the wine calendar … as in, not very long. Thoughts: As far as we can tell, this 11.-oz. Advent calendar includes an assortment of chocolates and truffles. It looks like it contains special filled and decorated chocolates that are fancier than what is contained in Aldi’s traditional Advent calendar or even in the Premium Advent Calendar (both shown below). This is top of the line as far as Aldi’s Advent calendars go. Thoughts: This is an 8.46-oz. box of specialty chocolates. It’s a mid-range product that’s a bit fancier than Aldi’s basic Advent calendar (shown below) but cheaper than the the name-brand Moser Roth calendar (shown above). Thoughts: This is a 2.65-oz. box of milk chocolates in various Christmas-themed shapes. I buy this chocolate calendar for my kids every year, and it’s always a hit. The price has increased from 99 cents to $1.29 over the last couple of years, but it’s still not a bad little Advent calendar, and it helps the kids keep track of how many days are left until Christmas. Bake House, Barissimo, Belmont, Benton's, Choceur, Friendly Farms, Happy Farms, Moser Roth, Simply Nature, The Festive Collection, Village Bakery. Bookmark.